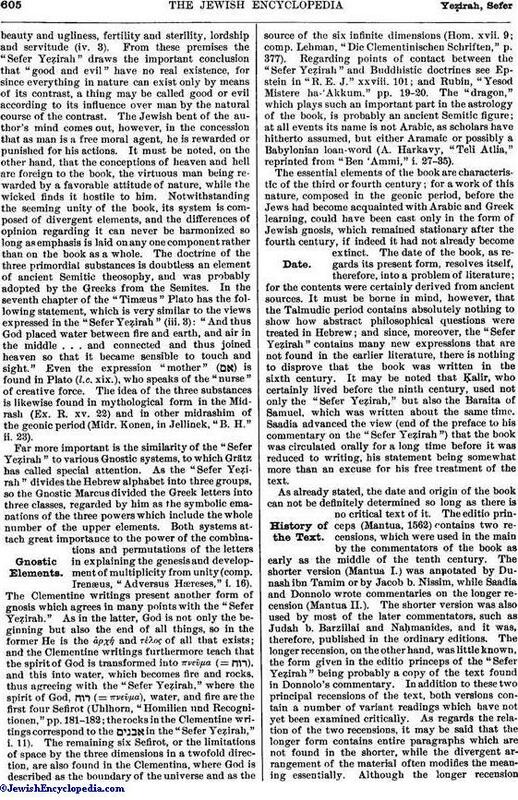 As the book is the first speculative treatise in Hebrew, and at the same time the earliest known work on the Hebrew language, the philological part may be discussed first, since it is necessary for an elucidation of the philosophical speculations of the work. The twenty-two letters of the Hebrew alphabet are classified both with reference to the position of the vocal organs in producing the sounds, and with regard to sonant intensity. In contrast to the Jewish grammarians, who assumed a special mode of articulation for each of the five groups of sounds, the "Sefer Yeẓirah" says that no sound can be produced without the tongue, to which the other organs of speech merely lend assistance. Hence the formation of the letters is described as follows: with the tip of the tongue and the throat; between the lips and the tip of the tongue; in the middle ([?] ) of the tongue; by the tip of the tongue; and by the tongue, which lies flat and stretched, and by the teeth (ii. 3). The letters are distinguished, moreover, by the intensity of the sound necessary to produce them, and are accordingly divided into; mutes, which are unaccompanied by sound, such as מ, which the book calls ; sibilants, such as ש, which is therefore called , the "hissing shin"; and aspirates, such as א, which holds a position between the mutes and sibilants, and is designated as the "airy א, which holds the balance in the middle" (iv. 1; in some eds. ii. 1). Besides these three letters ( ), which are called "mothers," a distinction is also drawn between the seven "double" letters ( ) and the twelve "simple" letters ), the remaining characters of the alphabet. 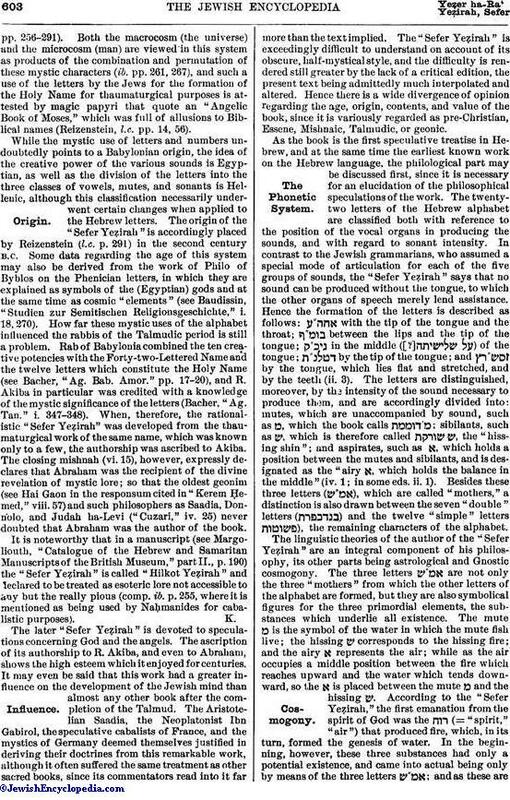 The linguistic theories of the author of the "Sefer Yeẓirah" are an integral component of his philosophy, its other parts being astrological and Gnostic cosmogony. The three letters are not only the three "mothers" from which the other letters of the alphabet are formed, but they are also symbolical figures for the three primordial elements, the substances which underlie all existence. The mute מ is the symbol of the water in which the mute fish live; the hissing ש corresponds to the hissing fire; and the airy א represents the air; while as the air occupies a middle position between the fire which reaches upward and the water which tends downward, so the א is placed between the mute מ and the hissing ש. According to the "Sefer Yeẓirah," the first emanation from the spirit of God was the (= "spirit," "air") that produced fire, which, in its turn, formed the genesis of water. In the beginning, however, these three substances had only a potential existence, and came into actual being only by means of the three letters ; and as these arethe principal parts of speech, so those three substances are the elements from which the cosmos has been formed. The cosmos consists of three parts, the world, the year (or time), and man, which are combined in such a way that the three primordial elements are contained in each of the three categories. The water formed the earth; heaven was produced from the fire; and the produced the air between heaven and earth. The three seasons of the year, winter, summer, and the rainy season ( ), correspond to water, fire, and in the same way as man consists of a head (corresponding to fire), torso (represented by ), and the other parts of the body (equivalent to water). The seven double letters produced the seven planets, the "seven days," and the seven apertures in man (two eyes, two ears, two nostrils, and one mouth). Again, as the seven double letters vary, being pronounced either hard or soft, so the seven planets are in continuous movement, approaching or receding from the earth. The "seven days," in like manner, were created by the seven double letters because they change in time according to their relation to the planets. The seven apertures in man connect him with the outer world as the seven planets join heaven and earth. Hence these organs are subject to the influence of the planets, the right eye being under Saturn, the left eye under Jupiter, and the like. The twelve "simple" letters created the twelve signs of the zodiac, whose relation to the earth is always simple or stable; and to them belong the twelve months in time, and the twelve "leaders" ( ) in man. The latter are those organs which perform functions in the body independent of the outside world, being the hands, feet, kidneys, gall, intestines, stomach, liver, pancreas, and spleen; and they are, accordingly, subject to the twelve signs of the zodiac. In its relation to the construction of the cosmos, matter consists of the three primordial elements, which, however, are not chemically connected with one another, but modify one another only physically. Power (δύναμις) emanates from the seven and the twelve heavenly bodies, or, in other words, from the planets and the signs of the zodiac. The "dragon" ( ) rules over the world (matter and the heavenly bodies); the sphere ( ) rules time; and the heart rules over the human body. The author sums up this explanation in a single sentence: "The dragon is like to a king on his throne, the sphere like a king traveling in his country, and the heart like a king at war." While the astrological cosmogony of the book contains few Jewish elements, an attempt is made, in the account of the creation, to give a Jewish coloring to the Gnostic standpoint. To harmonize the Biblical statement of the creation "ex nihilo" with the doctrine of the primordial elements, the "Sefer Yeẓirah" assumes a double creation, one ideal and the other real. The first postulate is the spirit of God, from which the prototypes of matter emanated, the world being produced, in its turn, by the prototypes of the three primordial substances when they became realities. Simultaneously with the prototypes, or at least before the real world, space was produced, and it is here conceived as the three dimensions with their opposite directions. The spirit of God, the three primordial elements, and the six dimensions of space form the "ten Sefirot," which, like the spirit of God, exist only ideally, being "ten Sefirot without reality" as the text designates them. Their name is possibly derived from the fact that as numbers express only the relations of two objects to each other, so the ten Sefirot are only abstractions and not realities. Again, as the numbers from two to ten are derived from the number one, so the ten Sefirot are derived from one, the spirit of God. The spirit of God, however, is not only the commencement but also the conclusion of the Sefirot, "their end being in their beginning and their beginning in their end, even as the flame is connected with the coal"(i. 7). Hence the Sefirot must not be conceived as emanations in the ordinary sense of the word, but rather as modifications of the spirit of God, which first changes to , then becomes water, and finally fire, the last being no further removed from God than the first. Besides these abstract ten Sefirot, which are conceived only ideally, the twenty-two letters of the alphabet produced the material world, for they are real, and are the formative powers of all existence and development. By means of these elements the actual creation of the world took place, and the ten Sefirot, which before this had only an ideal existence, became realities. 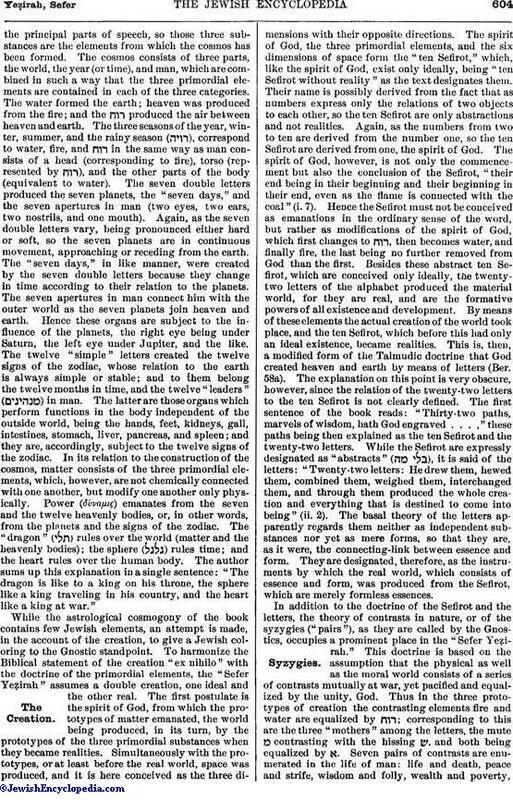 This is, then, a modified form of the Talmudic doctrine that God created heaven and earth by means of letters (Ber. 58a). The explanation on this point is very obscure, however, since the relation of the twenty-two letters to the ten Sefirot is not clearly defined. The first sentence of the book reads: "Thirty-two paths, marvels of wisdom, hath God engraved . . . ," these paths being then explained as the ten Sefirot and the twenty-two letters. While the Sefirot are expressly designated as "abstracts" ( ), it is said of the letters: "Twenty-two letters: He drew them, hewed them, combined them, weighed them, interchanged them, and through them produced the whole creation and everything that is destined to come into being" (ii. 2). The basal theory of the letters apparently regards them neither as independent substances nor yet as mere forms, so that they are, as it were, the connecting-link between essence and form. They are designated, therefore, as the instruments by which the real world, which consists of essence and form, was produced from the Sefirot, which are merely formless essences. In addition to the doctrine of the Sefirot and the letters, the theory of contrasts in nature, or of the syzygies ("pairs"), as they are called by the Gnostics, occupies a prominent place in the "Sefer Yeẓirah." This doctrine is based on the assumption that the physical as well as the moral world consists of a series of contrasts mutually at war, yet pacified and equalized by the unity, God. Thus in the three prototypes of creation the contrasting elements fire and water are equalized by ; corresponding to this are the three "mothers" among the letters, the mute מ contrasting with the hissing ש, and both being equalized by א. Seven pairs of contrasts are enumerated in the life of man: life and death, peace and strife, wisdom and folly, wealth and poverty,beauty and ugliness, fertility and sterility, lordship and servitude (iv. 3). 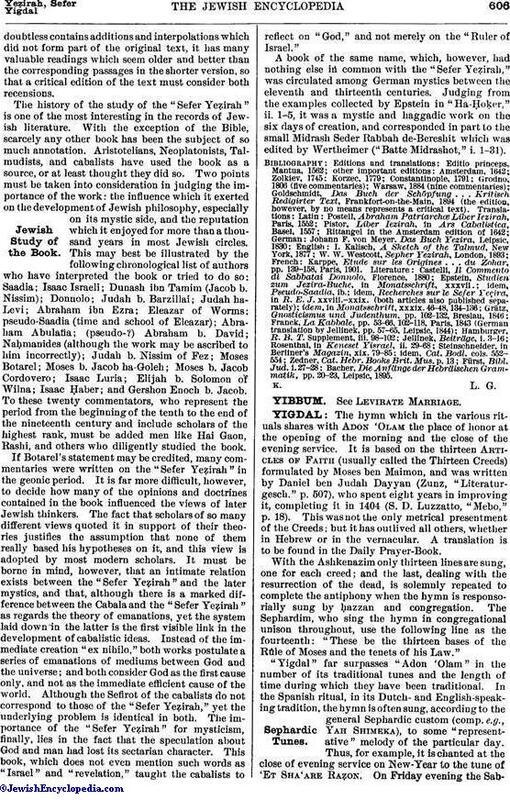 From these premises the "Sefer Yeẓirah" draws the important conclusion that "good and evil" have no real existence, for since everything in nature can exist only by means of its contrast, a thing may be called good or evil according to its influence over man by the natural course of the contrast. The Jewish bent of the author's mind comes out, however, in the concession that as man is a free moral agent, he is rewarded or punished for his actions. It must be noted, on the other hand, that the conceptions of heaven and hell are foreign to the book, the virtuous man being rewarded by a favorable attitude of nature, while the wicked finds it hostile to him. Notwithstanding the seeming unity of the book, its system is composed of divergent elements, and the differences of opinion regarding it can never be harmonized so long as emphasis is laid on any one component rather than on the book as a whole. The doctrine of the three primordial substances is doubtless an element of ancient Semitic theosophy, and was probably adopted by the Greeks from the Semites. In the seventh chapter of the "Timæus" Plato has the following statement, which is very similar to the views expressed in the "Sefer Yeẓirah" (iii. 3): "And thus God placed water between fire and earth, and air in the middle . . . and connected and thus joined heaven so that it became sensible to touch and sight." Even the expression "mother" ( ) is found in Plato (l.c. xix. ), who speaks of the "nurse" of creative force. The idea of the three substances is likewise found in mythological form in the Midrash (Ex. R. xv. 22) and in other midrashim of the geonic period (Midr. Konen, in Jellinek, "B. H." ii. 23). Far more important is the similarity of the "Sefer Yeẓirah" to various Gnostic systems, to which Grätz has called special attention. As the "Sefer Yeẓirah" divides the Hebrew alphabet into three groups, so the Gnostic Marcus divided the Greek letters into three classes, regarded by him as the symbolic emanations of the three powers which include the whole number of the upper elements. Both systems attach great importance to the power of the combinations and permutations of the letters in explaining the genesis and development of multiplicity from unity (comp. Irenæus, "Adversus Hæreses," i. 16). The Clementine writings present another form of gnosis which agrees in many points with the "Sefer Yeẓirah." As in the latter, God is not only the beginning but also the end of all things, so in the former He is the ἀρχή and τέλος of all that exists; and the Clementine writings furthermore teach that the spirit of God is transformed into πνεῦμα (= ), and this into water, which becomes fire and rocks, thus agreeing with the "Sefer Yeẓirah," where the spirit of God, (= πνεῦμα), water, and fire are the first four Sefirot (Uhlhorn, "Homilien und Recognitionen," pp. 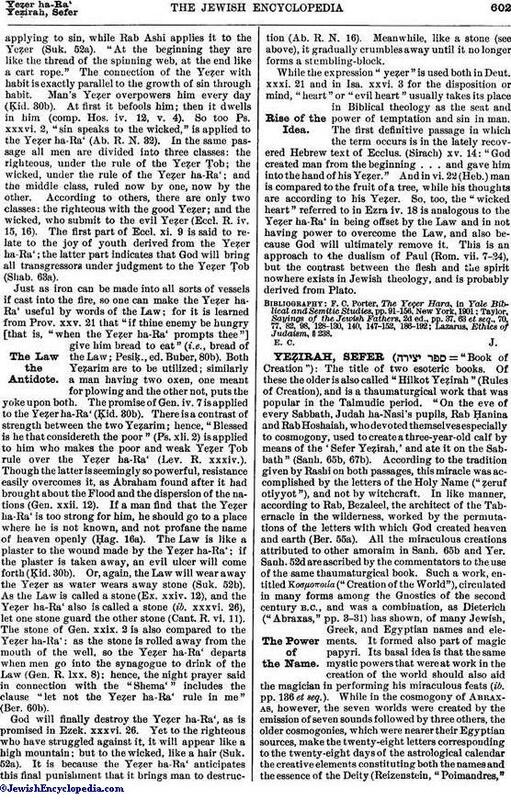 181-182; the rocks in the Clementine writings correspond to the in the "Sefer Yeẓirah," i. 11). The remaining six Sefirot, or the limitations of space by the three dimensions in a twofold direction, are also found in the Clementina, where God is described as the boundary of the universe and as the source of the six infinite dimensions (Hom. xvii. 9; comp. Lehman, "Die Clementinischen Schriften," p. 377). Regarding points of contact between the "Sefer Yeẓirah" and Buddhistic doctrines see Epstein in "R. E. J." xxviii. 101; and Rubin, "Yesod Mistere ha-'Akkum," pp. 19-20. The "dragon," which plays such an important part in the astrology of the book, is probably an ancient Semitic figure; at all events its name is not Arabic, as scholars have hitherto assumed, but either Aramaic or possibly a Babylonian loan-word (A. Harkavy, "Teli Atlia," reprinted from "Ben 'Ammi," i. 27-35).